So the final little bug in the comments software has now been worked out, and the Trusted User system is now running as it should. 37 registered users wrote comments last week, and the four whose comments got the best ratings from the community get to be Trusted Users until next Sunday, with added privileges and more control over the way everyone else’s comments are displayed. 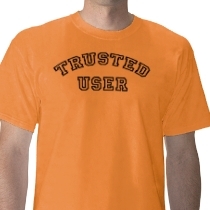 Everyone else: the contest for next week’s Trusted User status starts now. Work it!